I was totally in love with the recipe when I saw it on Neha's blog. I loved the amalgamation of sauces with honey and paneer. I felt the urge to make the moment I saw it last week but had to wait for the provisions to come in and to venture this. 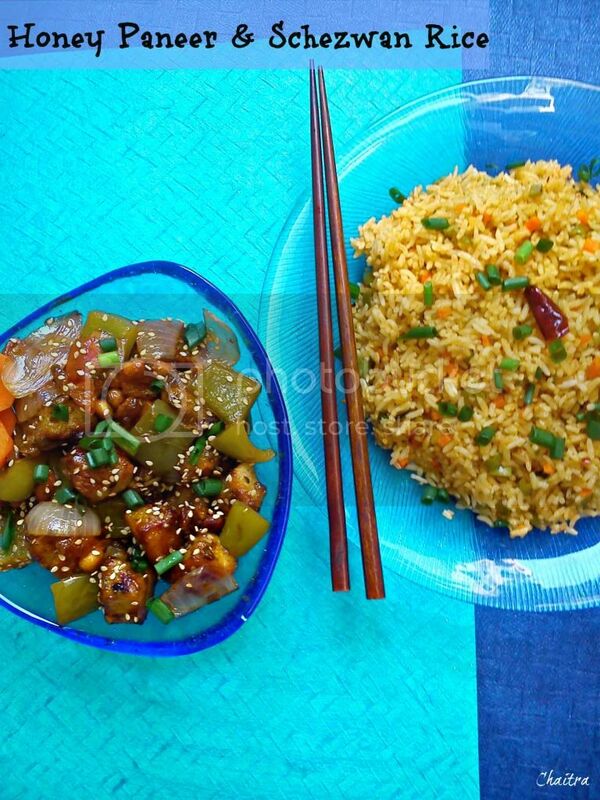 I loved it to the core and this is the best Chinese dish I have ever tasted and I surely owe it to you Neha. 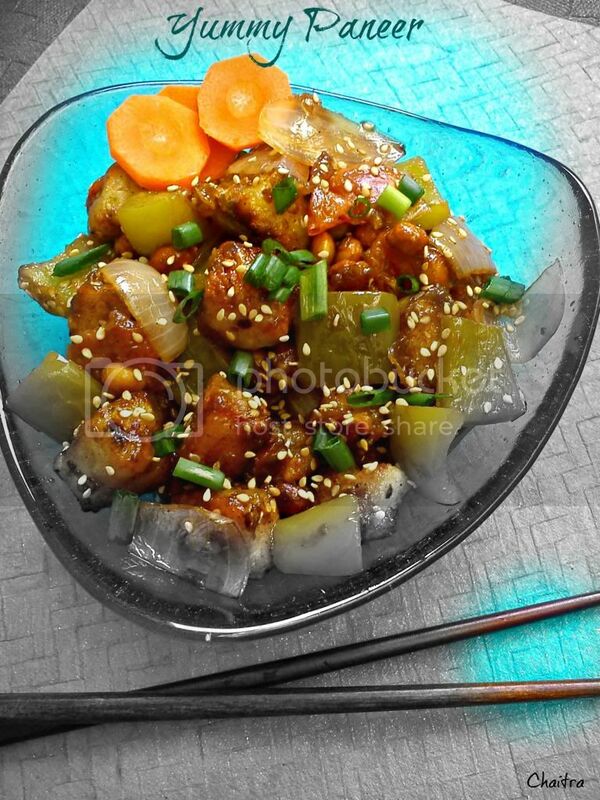 Do check out Neha's blog who not only does awesome cooking but her clicks will surely give you a gastronomical ride and looking at her clicks, I wanted to take beautiful pics for this recipe and I am sure, I did a decent job today with my pics and color combination as well. What do you say? If you are using frozen paneer allow it to come to room temperature or put them in boiling water for about 3 mins and make them soft. Make a thin paste using ingredients mentioned under Paneer coating and add paneer pieces to this mixture. Ensure that paneer pieces are coated well. 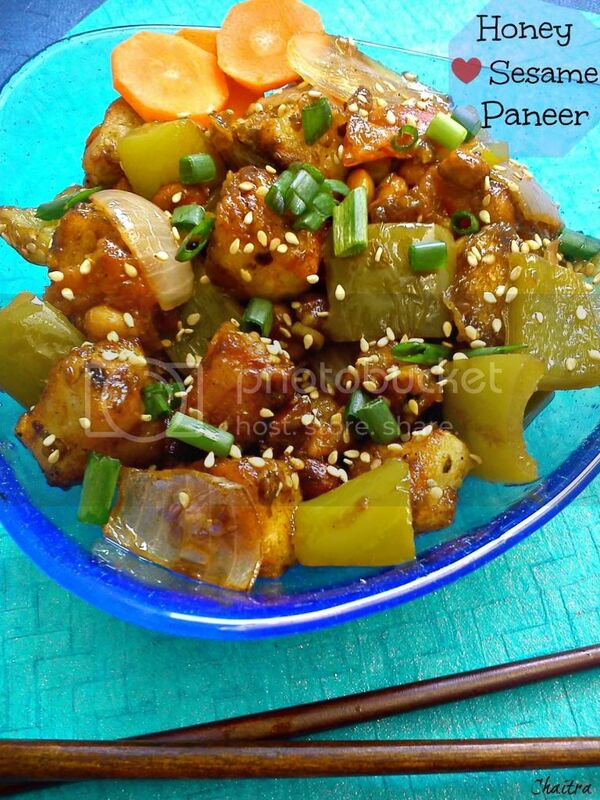 Heat oil in a frying pan and fry these coated paneer pieces until golden brown in color. Remove them and place them onto a kitchen napkin to squeeze excess oil. In a pan, add 2 tbsps of sesame seeds oil, add Ginger garlic pieces and fry until the pungent smell subsides. Now add onion, tomato and capsicum pieces and saute for about 1 min on high flame. Add remaining sauces except honey, peanuts and mix all the ingredients well. Add sesame seeds at this point. Add corn flour paste and keep stirring this mixture to avoid lumps. Once you attain saucy consistency, add paneer pieces and give a quick stir. Switch off the flame and after 5-10 mins, add honey. Ensure all the ingredients are combined well. 1) My mom says that you shouldn't add honey directly when you are cooking. So I was not sure of adding honey directly with sauces thought the original recipe calls for the same. I added it later. But both the ways it wouldn't effect the taste. 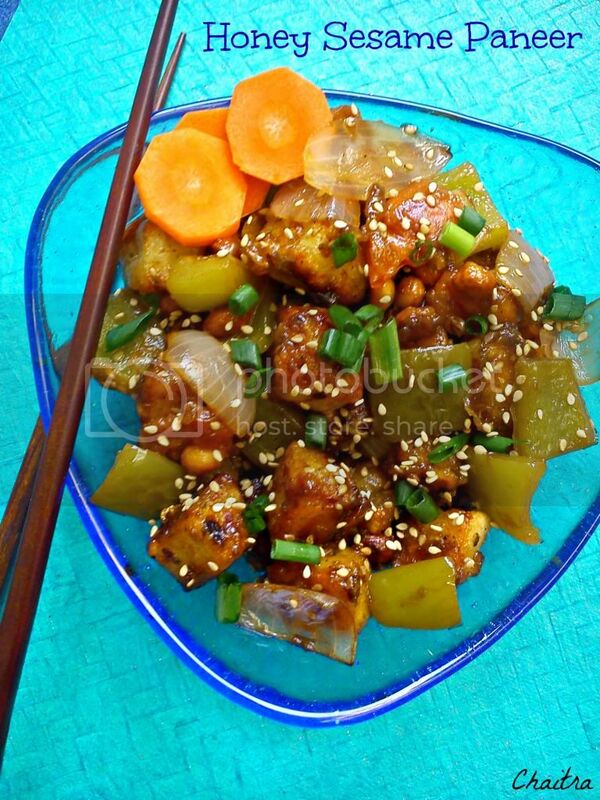 2) Do not allow this dish to stand for a longer time once prepared, paneer turned rubbery. 3) I have added chilly flakes and oregano to my cornflour paste, that's purely optional. Coming back to the recipe, I made this on a day when my heart demanded something crispy and spicy. Initially I thought of Onion Pakoda, then cheese balls and so on. But I got bored of them and wanted something new. In quest, I remembered having this recipe in one of the restaurants near my place. Me and Mr.P instantly fell in love with the dish but still i managed to gobble the major portion. Mine was close to restaurant style but not the same as I omitted Ajino moto. Here you go with the recipe. Oil- for frying and 2 tbsps for sauce. Boil baby corns in water and press them gently with both the hands to remove excess water. Make batter by adding water, corn flour, salt, pepper and maida. Consistency of the batter should not be too thick or too thin. Baby corn's should be able to hold the batter around them. 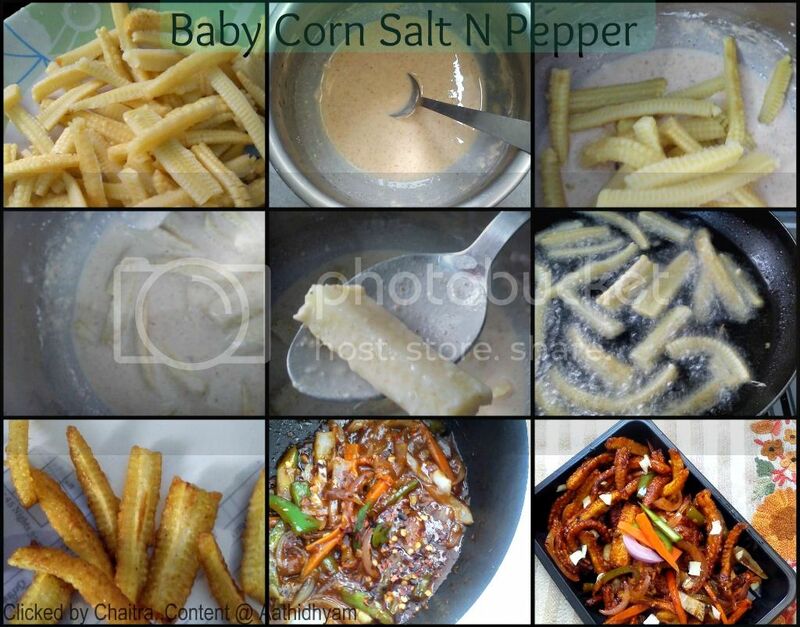 Dip each baby corn in the batter and coat them on all the sides well. Heat oil in a frying pan and golden fry baby corns in it. 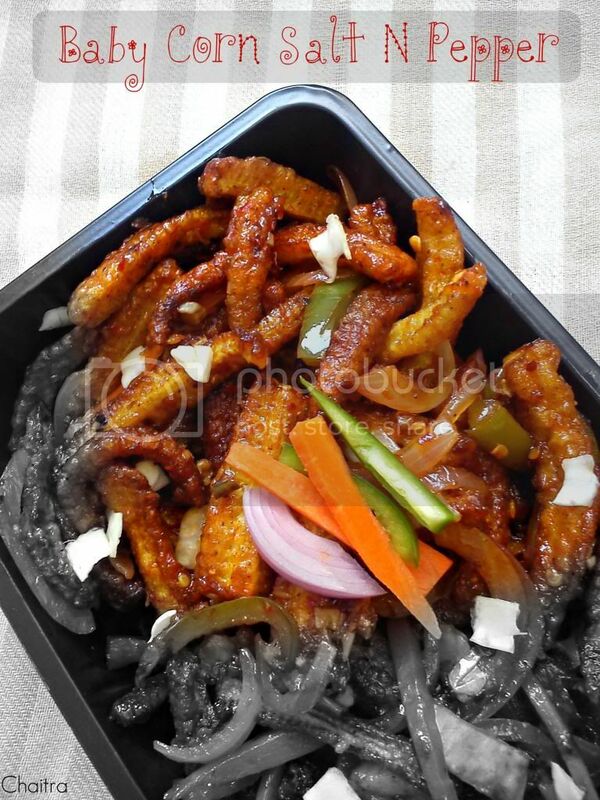 Transfer fried baby corn's onto a kitchen napkin to squeeze excess oil. In the same pan, remove the remaining oil and just have about 2 tbsps in it. Fry Garlic and ginger till the raw smell subsides. Add Onions and Capsicum together and adjust your flame to high. 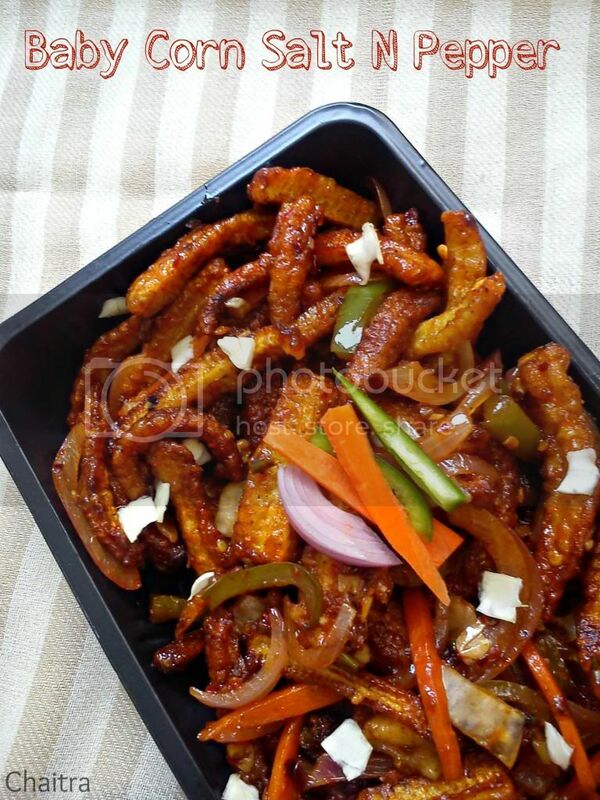 On high flame, toss onions and capsicum which retains their crunch. Add salt along with the sauces. Combine all the ingredients well. To this mixture add fried baby corns. Give a gentle swirl to all the ingredients to ensure even mixing. While you are doing so your flame is still on high mode. Sprinkle pepper on top and serve. I added chilly flakes and carrots in mine though the original recipe doesn't call for the same. 1) Instead of pepper you can use Chat Masala which gives an Indian twist. 3) Serve warm which is really important. I packed them in my lunch dabba and I found my baby corn's rubbery. That's it let me know your thoughts if you have tried it or let me know how your version is like..